Most homeowners are aware their homes are susceptible to damage from termites, but there are other common wood-destroying insects that can also damage houses. Wood-destroying insects, also referred to as WDIs, include carpenter ants, carpenter bees, and powderpost beetles. Carpenter ants are found throughout the United States. They are a larger species of ant at one-quarter to three-eighths of an inch long. 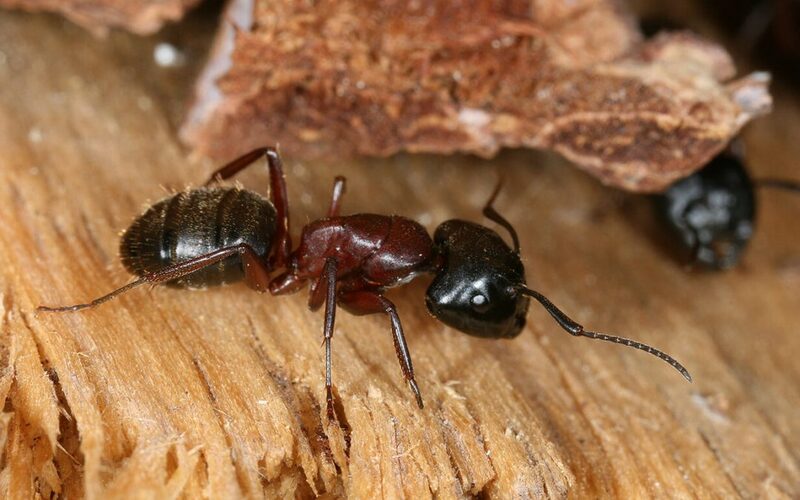 Most carpenter ants are black. Unlike termites, carpenter ants don’t eat wood. Instead, this pest bores into damp or rotting wood to nest. The wood-boring activity of carpenter ants can cause extensive structural damage to a home. Carpenter bees have an appearance that is similar to bumble bees. Like carpenter ants, these bees don’t eat wood. To make nests, this pest bores round half-inch holes into unfinished wood like the underside of a deck. Next, the carpenter bees tunnel through the wood to continue building their nest. A pile of material that looks like sawdust under the bored hole signals the presence of carpenter bees. Powderpost beetles are actually several different species of wood-boring beetles. Although some species attack a variety of woods, other species have a preference for hardwood or softwood. They are brown and less than a quarter-inch long. These beetles live throughout the United States. Among common wood destroying insects, powderpost beetles rival termites in terms of the amount of structural damage they cause. They bore into wood to lay their eggs. The resulting larvae eat through the wood until they exit as adults. Holes in the wood infested by powderpost beetles are exit points. Piles of powder-like dust are another indicator that powderpost beetles are present. Homeowners can discourage common wood-destroying Insects from making themselves at home in their homes. A good first step is to address leaks and other sources of excess moisture. Make sure water is properly directed away from the foundation by your home’s gutters and downspouts. Moist basements, attics, and crawl spaces should be dried out with appropriate ventilation. Another thing homeowners can do is maintain a well-kept yard. Rotting wood and tree stumps should be cleared from the yard. Firewood should be stored off the ground and away from the house. Mulch and foliage should be several inches away from the foundation. Detecting common wood-destroying insects before they cause extensive structural damage can be a challenge. Scheduling regular WDI inspections can help you save money by catching a problem early before significant damage is done. AWP Home Inspections provides WDI inspections and other home inspection services to West Central and Central Indiana. Contact us to request an inspection.